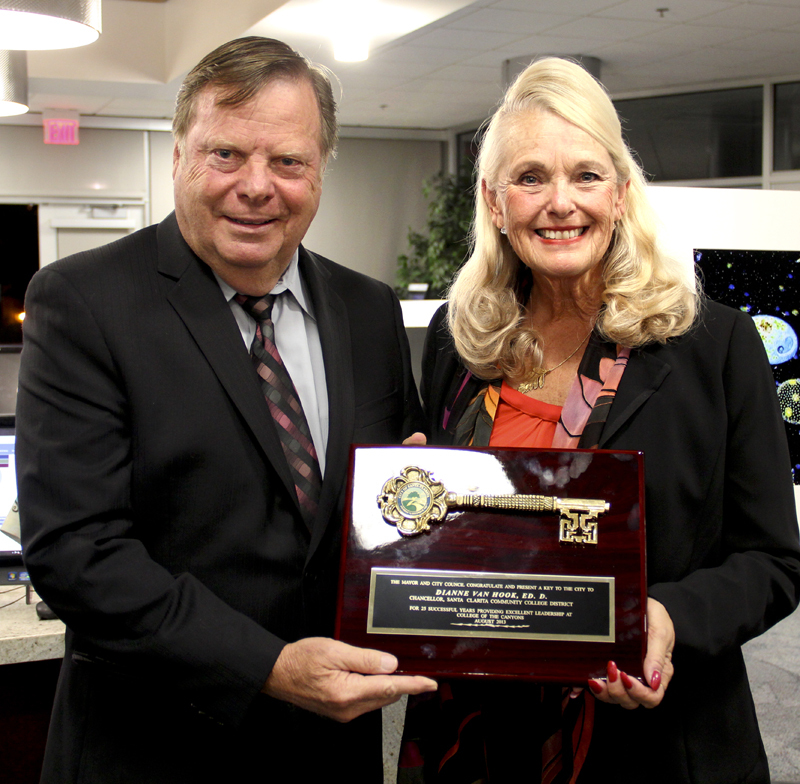 October 26, 2013 — Santa Clarita Mayor Bob Kellar presents the key to the city to Dr. Dianne Van Hook, chancellor of College of the Canyons, during a brief ceremony at the 2013 Chancellor's Circle Dinner. College of the Canyons, 11-14-2013 — College of the Canyons Chancellor Dr. Dianne Van Hook has received the Key to the City of Santa Clarita in recognition of her 25 years of dedicated leadership to COC and the Santa Clarita Valley. Mayor Bob Kellar bestowed the honor on Dr. Van Hook during the college's annual Chancellor's Circle Dinner. The dinner is hosted each fall by the College of the Canyons Foundation as a thank you to members of the Chancellor's Circle membership group, which supports college initiatives. "Dr. Van Hook's career has been a remarkable one and her longevity has been, and continues to be, an asset to our community," Kellar said. "I know I speak for every one of our City Council members when I say her enthusiasm and drive aren't easily found and we appreciate her vision and commitment to making our community one of the best in California." The presentation is especially significant given the relatively few times the City has given the award. Fewer than 30 keys have been presented in the City's 26-year history. The award was particularly meaningful to Dr. Van Hook, given the long history of partnership and collaboration between College of the Canyons and the City of Santa Clarita. "Personally, I have always appreciated the City's support and belief in the college and what we could become," Van Hook said. "The City's interest in and support of us makes a huge difference in what we do for the benefit of this community. From the University Center, to the Small Business Development Center, to the Canyon Country campus, to the Performing Arts Center, we wouldn't be able do what we do without great partners like the City of Santa Clarita." CO1320: 19200 dpi jpeg from digital image by Eric Harnish/College of the Canyons.